This Saturday morning, six armed men entered a hotel in Tegucigalpa and intimidated international electoral accompaniers from El Salvador. Despite this incident , the accompaniers stated that they will continue to monitor the elections, with the goal that Hondurans can freely exercise their right to vote. On Saturday, a group of six armed men stormed the Aurora Hotel in Tegucigalpa ( capital of Honduras ), in an attempt to frighten international observers that will be present this Sunday during the Honduran general elections. The TeleSur special correspondent in Honduras, Madeleine García , reported via the social network Twitter that the incident occurred at 10H30 local time on Saturday, when ” six armed men entered the Aurora Hotel, which is near the presidential palace in Tegucigalpa, the Capital ” . “In the lobby of the hotel were mayors and deputies, who form part of the delegation of 40 international observers from El Salvador ,” said Garcia in hes account @ madeleintlSUR . The journalist quoted Deputy Nidia Diaz, who was with the group and explained that ” When 6 armed men entered, 3 other men arrived wearing Immigration shirts”. “I approached the men from Immigration and told them that we had entered Honduras legally yesterday and with credentials ,” said the deputy. 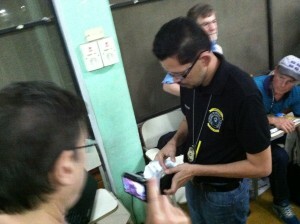 ” What happened today is a violation of the law, because as election accompaniers, we have legal rights,” said Diaz. Despite the incident , Diaz said ” We are going to continue in Honduras, standing by the people in this process to exercise their rights ” . The Supreme Electoral Tribunal ( TSE) signed an agreement with major media outlets on Wednesday, in which the press has agreed not to broadcast polling results of surveys or exit polls before Sunday 19H00 local time ( 01H00 GMT Monday) . The TSE estimates that more than three million people go to the polls, but actual registered voters equal more than five million persons older than 18. The Committee of Relatives of the Disappeared in Honduras ( COFADEH ) denounces that the night Friday, November 22 , military police attempted to break into the headquarters of the party LIBRE party in the Kennedy Colony of Tegucigalpa, Honduras. A few minutes before ten o’clock, three patrols of military police arrived , with approximately 12 troops in each patrol. Covering their faces with balaclavas , the troops began to surround the location , intimidating the four people who were there at the time. Upon calling other members of their party, neighbors from the colony arrived and word of the situation spread through various media. The military police troops left , driving past the house of a candidate of the LIBRE party. Neighors, media and International Election Observers, responding to the news, remained at the headquarters. At approximately 10 am the morning of 22 of November, 4 people identifying themselves as Honduran Immigration agents, arrived at the offices of ERIC-SJ (Equipo de Reflexión Investigación y Comunicación – Honduras) , asking to see members of the HSN/AGJ delegation of international observers in Honduras for national elections this Sunday. 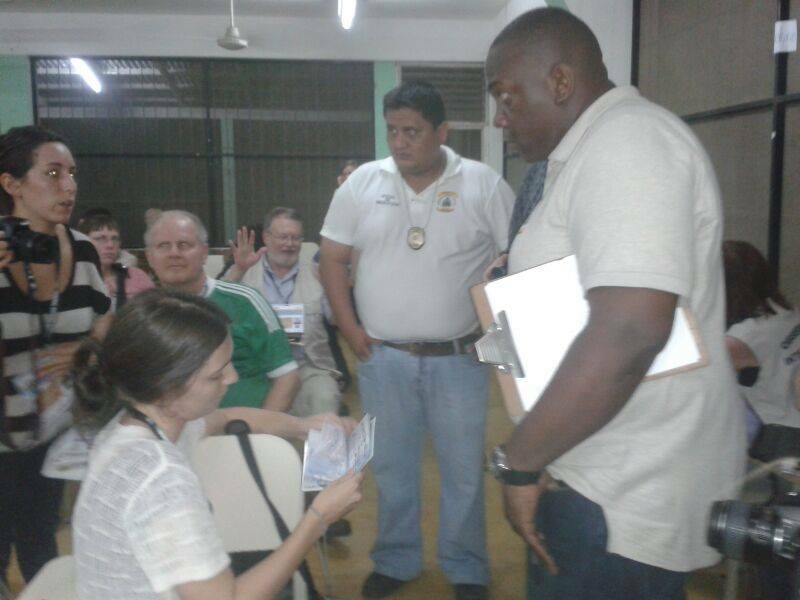 The delegation, which was not present at the time, is comprised of 166 persons from the United States, Canada, and El Salvador who have been accredited by the Supreme Electoral Tribunal of Honduras as official election observers. Having failed to find their first target, the demanded to see the identification of all the Hondurans present at the offices of ERIC-SJ. Later at 7 pm this evening (11/22/2013), the same group of agents disrupted an election observer training of the HSN/AGJ delegation at the La Fragua retreat center in Progreso, Honduras. Without prior warning, the officials intimidated observers by demanding to see everyone’s passports and observer credentials. Election observer credentials are not needed for proof of legal immigration status. The fact that Agent Reynaldo demanded each person’s observer credentials reveals an interest that exceeds the duties of an immigration agent. The TSE Trainer Sra. 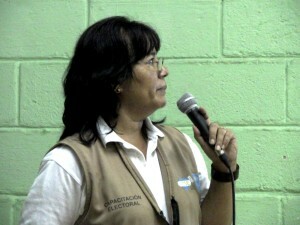 Robles who performed an official election observer training shortly before immigration officials interrupted a later session for delegates. Ironically only one hour earlier, the delegation completed three hours of formal training in the same room with official representatives of the Supreme Election Tribunal. 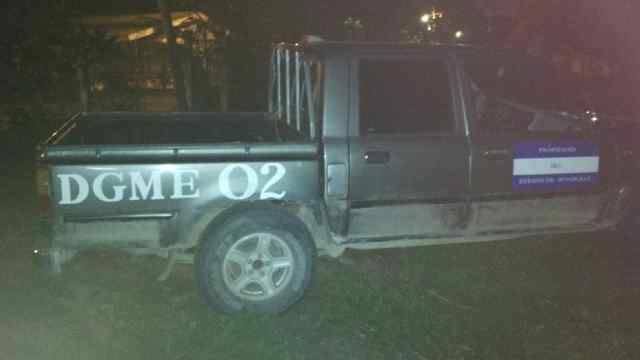 In total, four persons arrived in a grey crew-cab truck without license plates– but with DGME (official Immigration Department) lettering– and drove onto the private property. Their leader was Juan Reynaldo, badge number 066, and his associates were Cesar Medina, badge 086, Walter Ramos, badge 088, and Diana Avila, badge 052. Originally, Agent Reynaldo said he was responding to complaints from neighbors. Later, he changed his story to say that General Bernardino Cervantes had sent orders from Tegucigalpa to investigate the group. The Honduran Government’s Deputy in charge of immigration in Yoro Province, Magdalena Medina, claimed to know nothing of the incident. Although the Honduran government begrudgingly has permitted international election observers for the tense, high-stakes elections this Sunday, this calculated act of harassment exposes the government’s desire to conduct this election outside the view of the concerned human rights and pro-democracy forces. Delegates consider these actions as a clear and hostile attempt by the Honduran government to intimidate us and to delegitimize the voices of electoral observers who have arrived in good faith to witness Sunday’s historic vote. This morning, Honduran officers from Migración y Extranjería arrived at the installations where HSN Northern delegations are staying and training in El Progreso, requesting that they speak to the HSN group. Since the group was in San Pedro Sula participating in a press conference, the Officers checked the IDs and documents of the Hondurans that work with ERIC that were present. At approximately 7:00 pm, the Migration Officers showed up again to FRAGUA [adjacent to the ERIC offices] during the HSN training and began checking all documents of the HSN group. They are also requesting a meeting with the group for next Tuesday to handle the issue. All HSN delegates are U.S. citizens and provided the necessary documents requested by the Officers. In another incident of intimidation, one of the van drivers of another HSN delegation was approached by an unknown man this morning, as he was waiting for the group in the parking lot. The unknown individual was insisting that the van driver provide information about the group including where they were going, what they were doing, etc. The unknown individual was taking pictures of the van and the license plate of the vehicle as well. This is nothing but pure intimidation against the group, all of which have ‘International Accompanier’ credentials from the Supreme Electoral Tribunal (TSE). One hundred sixty-six people from the United States and Canada will serve as election accompaniers and human rights observers during the upcoming national elections in Honduras. 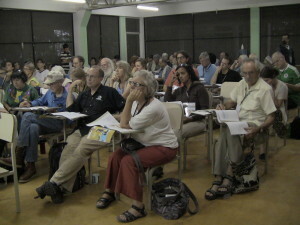 The delegation is organized by the Honduras Solidarity Network – Alliance for Global Justice and the participants come from organizations, churches, and communities throughout the U.S., Canada and El Salvador. The HSN/AGJ delegation represents the largest body of electoral observers from the US that will observe the 2013 Honduran elections. We are here in good faith as elections accompaniers and our goal is to accompany the people of Honduras in their electoral process as they seek social justice in their country. However, we recognize that our limited presence cannot and will not guarantee a fair election. The elections are taking place at a time when international and Honduran human rights groups have expressed alarm at conditions that may prevent the possibility of fair and free elections in Honduras. On October 15, U.S. Congressmen Grijalva, Honda and Johnson sent a letter urging Secretary of State Kerry highlighted a “pattern of concerted attacks targeting human rights defenders and the opposition.” The lawmakers urged Kerry to monitor a potential militarization of the country during the electoral process. According to a report by the U.S. and Canadian-based Rights Action, there have been numerous murders and attacks against political party members during the campaign thus far. Rights Action reported that the LIBRE party has been most at risk: 18 LIBRE candidates and activists have been murdered and 15 injured in armed attacks. A new military-police force created by the current ruling party is raiding homes of LIBRE members and supporters. New threats and assassinations are occurring weekly. On October 28, Honduran human rights organizations testified at the Organization of American States’ Human Rights Commission on the threats and attacks against their members. There has been a publicity campaign to discredit human rights defenders in the country, both Hondurans and internationals. Various officials have made strong statements against them, making it seem as though they want to discredit the Honduran and international human rights observers in order to negatively affect their capacity to defend the rights of Honduran people. Most of us are U.S. citizens, and we are very concerned about recent statements by U.S. Ambassador Kubiske, which imply that the U.S. national interest is against the LIBRE party or in favor of other political parties. We denounce any kind of intervention by our government – the US Government—whether in the form of statements or actions, that could interfere with a free and fair vote. We are also disturbed about the role of U.S. security aid in exacerbating the current crisis described above. By calling attention to the human rights concerns of Hondurans, we hope that they may be promptly addressed by the appropriate local and international bodies. Finally, we hope that that this election will truly reflect the aspirations of the Honduran people.